The Gas Pressure Sensor has enough resolution and range to work for all subject areas. Chemistry teachers will find that it has enough range for Boyle’s law experiments (0 to 2.1 atm), yet provides sufficient resolution for vaporpressure or pressure-temperature experiments (0.40 mm Hg with LabQuest). For biology teachers, the package includes airtight tubing clamps for transpiration experiments, as well as fittings for respiration experiments in small containers. The included Pressure Sensor Accessories Kit contains the following: 20 mL syringe, plastic tubing with 2 Luer-Lock connectors, 2-hole rubber stopper with two Luer-Lock adapters, 2-way valve, 1-hole rubber stopper with one adapter, and 2 airtight tubing clamps. 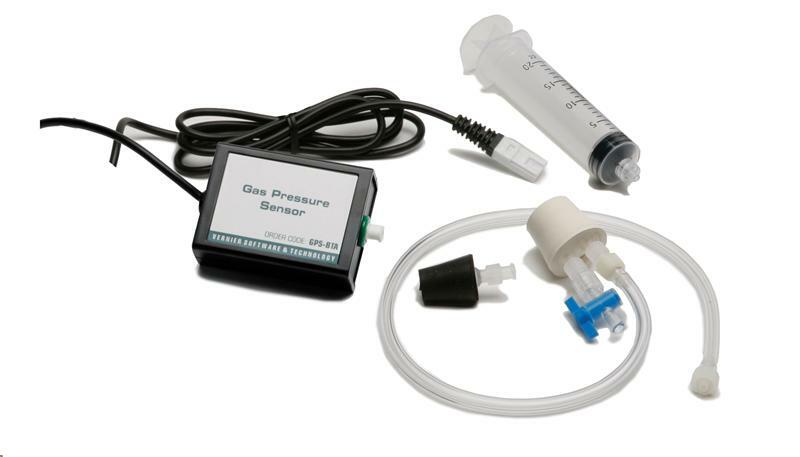 The Gas Pressure Sensor requires a compatible interface and software to collect data. Interface and software sold separately.